The Radical Self Journal is a journey of self-exploration through writing. It combines the free flow of daily writing prompts with the structure of tracking tools to review the week, track your goals and a monthly cycle tracker to chart the lunar phases and your menstrual cycle (if you have one) because clarity is empowering. Read more and order yours here. The Radical Self Journal was successfully crowdfunded on StartSomeGood in November 2017. This journal, was lovingly made in Australia by Kate Alexandra and Designed by Anna Warna. The journal covers a 14 week guided writing process, during this time you will reflect on a wide range of aspects of your life and crafted a nourishing self-care practice, that is unique to you and flows with your own natural rhythms (not the ones forced on you by everyone else). By writing each day you come in to conversation with yourself; you'll reflect on events passed and set intentions for the days to come. Over the 14 week writing journey you will better understand what you truly need and the courage and self-compassion to create more nourishing rhythms in your life. WHY WE NEED RADICAL SELF-CARE aka "Manifesto-ish"
Self-care is so much more than the “treat yo-self” activities we are sold by the health and beauty industries; haircuts, manicures, green smoothies, a bit of lippy and an online shopping spree are not the limit of 'self-care. Authentic self-care is the work of truly knowing and caring for ourselves, so we may become better able to give love and care to others; positively impacting the world by embodying our values, living wholeheartedly and knowing what we stand for. 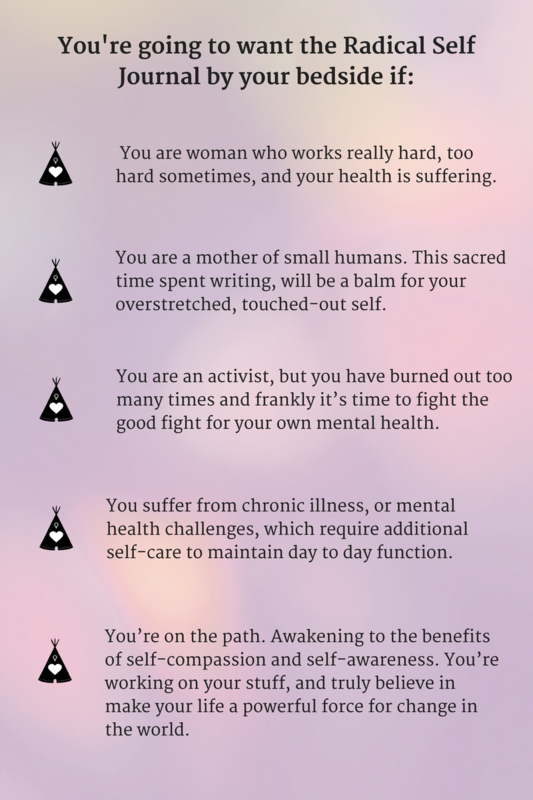 The journey to authentic self-care can be a tough one, especially if you were not raised to know love and care; you are working really hard and are burned out; you are nurturing small humans and barely have a moment to breathe; you live with a chronic illness or mental health issues. The practice of intentional self-care may just change your life - radically; connecting you to your deepest needs and most heartfelt desires- the essence of who you are. Kate Alexandra Yoga offers a spectrum of yoga experiences: online yoga for mamas and mamas-to-be; one to one yoga therapy and personalised small group classes in Waverton, on Sydney's Lower North Shore.